Metrosil provides effective protection against voltage surges in high impedance relay schemes. Metrosil Relay Assemblies are available in various configurations, typically single-PH or 3-PH. Single disc Metrosil Relay Assemblies are suitable for secondary internal fault currents up to 50A rms. Metrosil Relay Assemblies with three discs connected in parallel are used for larger fault currents over 50A rms. Correct Metrosil selection ensures that the best protection is obtained while maintaining a Metrosil leakage current low enough to have negligible effect on the accuracy of the relay at its maximum setting voltage. The Metrosil chosen depends on the relay setting voltage and the maximum secondary internal fault current. Relays attached to Current Transformers with 1A rated Secondary Output. 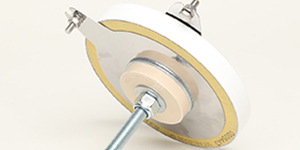 Single disc Metrosils are suitable for secondary internal fault currents up to 50A rms. 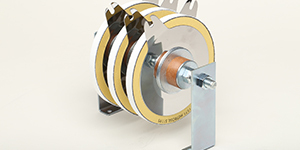 Relays attached to Current Transformers with 5A rated Secondary Output. Metrosils with multiple discs connected in parallel are used for larger fault currents. If you require a bespoke specification, please refer to this guide and contact our technical team.